After releasing Feelin’ Good At the Cadillac Club on Gamble Records in 1968 and Ebony Woman on Neptune in 1970, Billy Paul signed to a newly formed label in Philadelphia, founded by two songwriters, musicians and producers. The label was Philadelphia International Records and the two founders were Kenneth Gamble and Leon Huff. Neither Billy Paul, nor Gamble and Huff had any idea of what would follow and the effect both would have on soul music. Billy Paul, who’d release Philadelphia International Records’ first album in 1971, Going East and become Philadelphia International Records’ first male superstar. Philadelphia International Records would go on to release some of the most influential, innovative and commercially successful albums of the seventies. However, the album that launched the nascent label was Going East, Billy Paul’s third album. A year later, Billy Paul would release his most successful album 360 Degrees of Billy Paul, which contains a song that has become synonymous with Billy Me and Mrs Jones. That was all to come. Before that, was the album that launched one of the most innovative and influential record labels, Philadelphia International Records, Going East, Billy Paul’s third album and the album that brought him to the public’s attention. Recording of Going East would take place at Sigma Sound Studios, where all the future Philadelphia International Records’ recordings would take place. Gamble and Huff would produce the album, with Bobby Martin, Lenny Pakula and Thom Bell arranging the album’s nine tracks. For the recording sessions at Sigma Sound, many musicians who’d become part of M.F.S.B. played on the sessions. This included guitarist Norman Harris of the Baker, Harris, Young rhythm section, vibraphone player Vince Montana and Don Renaldo’s string section. In total, nine tracks were recorded, with just Love Buddies written by Gamble and Huff. The rest of the tracks were written by other songwriters, including Bobby Martin, who cowrote I Wish It Were Yesterday with Lee Phillips. Once Billy had recorded the nine tracks that became Going East, Philadelphia International Records were ready to release their very first album. How would Going East perform commercially? On the release of Going East in 1971, it entered the US Billboard 200 at 197. It fared better in the US R&B Charts, reaching number forty-two. Although this wasn’t the most successful album of Billy Paul’s career, it wasn’t bad for a new artist on a newly founded label. However, the next album Billy would release would prove much more commercially successful, 360 Degrees of Billy Paul. That was still to come. Going East, which preceded it, is an ambitious, genre defying album, with nine tracks, which span jazz, funk and Philly soul, that I’ll now tell you about. Opening Going East is East, written by Philly bassist and baritone Tyrone-William Brown and arranged by Lenny Pakula. Even an early Philadelphia International release like Going East demonstrates Gamble and Huff’s determination to innovate and push musical boundaries. This is shown with their use of the sound of an airplane taking-off, preceding Billy’s thoughtful and moving spoken word introduction. As the track begins to reveal its secrets, Billy’s vocal is full of emotion, while percussion, keyboards and the rhythm section combine to produce a jazzy backdrop. Strings cascade, while the bass prowls along the arrangement and Billy’s heartfelt vocal. It’s key to the track’s success, along with the lyrics and Lenny Pakula’s atmospheric and dramatic arrangement. Very different from the opening track is (If You Let Me Make Love To You Then) Why Can’t I Touch You? It’s much quicker, with a jaunty arrangement, where punchy, rasping horns and sweeping, swirling strings accompany Billy’s impassioned vocal. Again, Thom Bell’s arrangement is jazz-tinged, but still soulful. Strings dance above his emotive, needy vocal, while the rhythm section provide the track’s heartbeat. Although it’s quite different from the opening track, Billy and his band combine to create a track that although jazz-tinged, is still soulful and emotive. Jimmy Webb wrote This Is Your Life, which has a lovely understated arrangement, with just the piano and lush strings accompanying Billy. His vocal is thoughtful, augmented by backing vocalists, while the entrance of the rhythm section signals the arrangement’s unfolding. Bursts of rasping horns punctuate the arrangement, while the strings sweep slowly, and Billy delivers one of his most impassioned, emotive and beautiful vocals on the album. This he does against an arrangement that’s understated and beautiful, perfect for Billy’s vocal. Moh Jakke wrote Jesus Boy (You Only Look Like A Man), a track that’s bathed in drama from the opening bars. This is due to a combination of drums and short, sharp bursts of horns, before the Hammond organ and grand strings enter. Billy’s vocal is thoughtful, considered and understated. Backing vocalists accompany him, soaring elegantly and powerfully above the arrangement, as the track becomes dramatic and even, grandiose. By now, Billy’s vocal has grown in power and passion, as the arrangement quickens and slows, adding to the drama and effectiveness of the track. Demonstrating the variety of music on Going East is Magic Carpet Ride, a track which sees the album change direction again. From a jazz-tinged start, the track quickly changes, with Billy’s vocal quick, delivered at breakneck speed, but in a soulful style. After this, the rhythm section, percussion and flute, then later, Hammond organ combine to drive the track along on a tour of musical genres. This journey takes in elements jazz, funk, sixties rock and soul. It truly is a Magic Carpet Ride, where Billy and his band visit a variety of musical genres. During his time with Philadelphia International, Bobby Martin would become one of the label’s best arrangers, before later, forging a successful career as a producer. On I Wish It Were Yesterday we get the chance to hear a song Bobby cowrote with Lee Phillips. It proves that not only is Bobby Martin a hugely talented arranger and producer, but an equally talented songwriter. Bobby’s arrangement is stunning, with the lushest of strings and slow piano accompanying Billy’s heartfelt and beautiful vocal. With just occasional flourishes of guitar and old style jazz bass, the most beautiful song on the album takes shape, mixing a heartfelt vocal and jazz drenched arrangement. Compared To What continues the jazzy style, with the rhythm section and stabs of Hammond organ combining with piano. Billy’s vocal has a similar jazzy style, complete with bursts of punchy, blazing horns and flute. Here, this nascent version of M.F.S.B. get a chance to kick loose, doing so, with aplomb, proving their talent and versatility. This would be put to good use over the next decade or so. Billy meanwhile, gives a powerful, impassioned vocal, seamlessly demonstrating his versatility and talent. Love Buddies was the only Gamble and Huff penned track on Going East. However, quality as anyone knows, is more important than quantity. With the sultriest of saxophone and Vince Montana’s vibes combining with the piano, Billy’s vocal is full of emotion, heartfelt and impassioned. Again, there’s a jazzy sound to Bobby Martin’s arrangement, with slow, lush strings adding to the emotion and beauty of the track. Billy delivers one of his best vocals on what is, one of the real highlights of Going East, showing his ability to bring a song to life, with the emotion and passion that’s present in his vocal. Closing Going East is a track by Richard Rogers and Lorenz Hart, There’s A Small Hotel. It’s the perfect track to close the album, allowing Billy’s vocal to take centre-stage. His vocal is a combination of subtlety and passion, while the understated arrangement combines slow, lush strings and a piano provides the perfect accompaniment. Together, Billy and the band bring out the beauty in Rogers and Hart’s classic song. Although Going East was Billy Paul’s first album for Philadelphia International Records, he’d previously released two other albums and worked with Kenneth Gamble. This is reflected in the nine tracks that make up Going East. It’s a mature, highly accomplished and polished album, with this polished sound becoming something associated with Gamble and Huff and the Philly Sound.The music on Going East is more jazz than soul. Having said that, there’s no shortage of soul on the album, with several of the track fusing jazz and soul. While Gamble and Huff only wrote one track on Going East, Love Buddies, it was one of the highlights of the album, bettered only by I Wish It Were Yesterday, which Bobby Martin cowrote. To me, it’s the best track from the album, showing that Bobby Martin wasn’t just a hugely talented arranger and producer, but songwriter too. The track that opens Going East, East was also written by another Philadelphia musician, Tyrone-William Brown and is one of the most moving and powerful tracks on the album, with a similar power as The O’Jays Ship Ahoy. Overall, the music on Going East points towards the future sound of Billy Paul, Gamble and Huff and the Philly Sound. Similarly, the musicians that played on the album demonstrate the talent, versatility and sound that M.F.S.B. would become famous for. 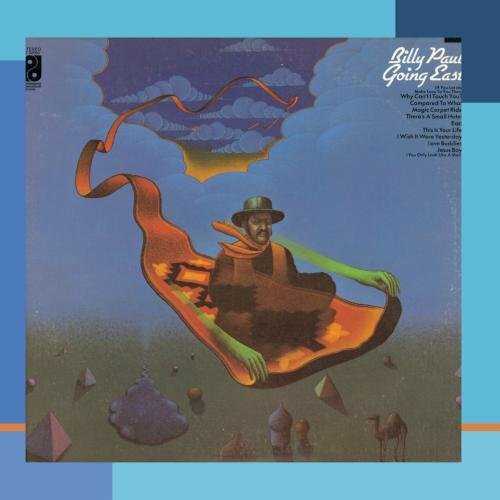 All this makes Going East, Billy Paul’s debut album for Philadelphia International Records such an important album in the history of Philadelphia International Records. A year later, Billy Paul would go on to release his most successful album, 360 Degrees of Billy Paul, which included Me and Mrs Jones, the song that would become synonymous with Billy Paul. For anyone whose either a fan of Billy Paul, the Philly Sound or just music in general, then Going East, the album that launched a legendary label is well worth discovering. Standout Tracks: East, I Wish It Were Yesterday, Compared To What and Love Buddies. ← AUNTIE AUBREY’S EXCURSIONS BEYOND THE CALL OF DUTY PART 2-THE ORB REMIX PROJECT.